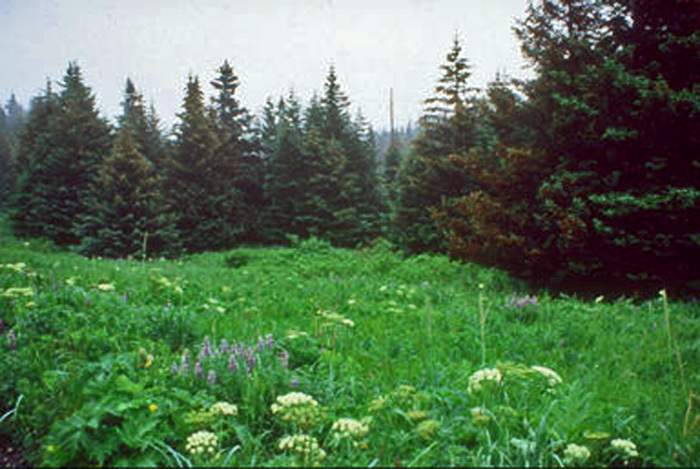 Alaska is home to the two largest national forests in the United States. The Tongass National Forest in Southeast Alaska is the largest. Chugach National Forest in Southcentral Alaska is the next biggest. 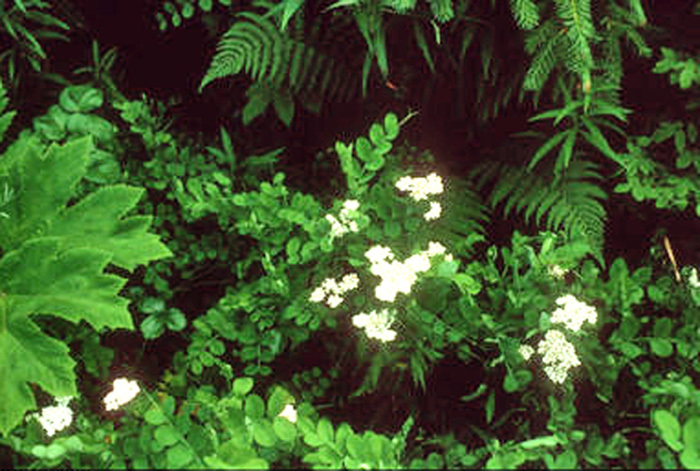 Both are considered coastal rain forests. In the Interior you will find the boreal forest (you can read more about that below on this page). In Alaska's coastal rain forest, you'll find huge old-growth spruce, cedar, and hemlock trees. 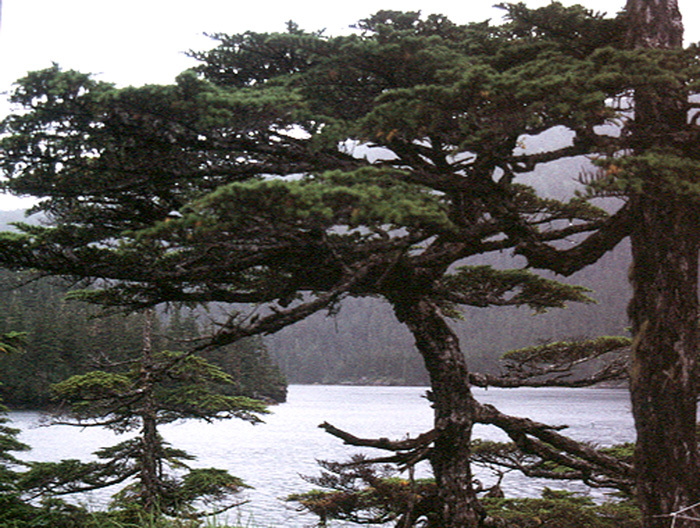 The Sitka spruce is Alaska's State Tree. It can grow up to 200 feet tall, taller than the BP building in Anchorage. Its trunk can be 3 to 5 feet thick, or about as wide as a 6th grade student is tall. Mild temperatures and lots of rain -- more than 100 inches each year -- make Alaska's coast perfect for trees to grow big and tall. Beneath these tall trees is a mass of plants that actually help the trees. Thick mosses and lichens carpet the coastal rainforest. Many of these grow up the sides and into the branches of the massive trees. These mosses act as sponges to provide an ongoing supply of water to the trees. The trees and the plants that grow around them also provide the perfect habitat for lots of animals. The Chugach National Forest is home to record-sized moose. Some of these have antlers that spread 6 feet from tip to tip. More than 200 birds are also found in the Chugach. Many of them rest at the Copper River Delta as they fly north to nest in the Arctic. In the Tongass, bald eagles gather in the thousands to feed on late runs of salmon each fall near Haines. Brown and black bears, deer, moose, wolves, beaver, red fox, marten, and porcupine live in the forest. Mountain goats and Dall sheep like the mountainsides. Biologists think that 1,700 brown bears live just on Admiralty Island in the Tongass National Forest. The Tongass is also well-known for the Sitka black-tailed deer that is found throughout the forest. At water's edge, there is a range of sea mammals as well. Whales, porpoise, dolphins, sea otters, and seals swim offshore. Then there are the fish. In both the Chugach and Tongass, all five species of salmon are found. President Theodore Roosevelt established the Tongass National Forest in 1907. He wanted to protect the trees and the fish and wildlife there. Today, the Tongass covers 17 million acres. That makes it the largest national forest in the United States. Less than 20 percent of Southeast Alaska is outside the borders of the national forest. 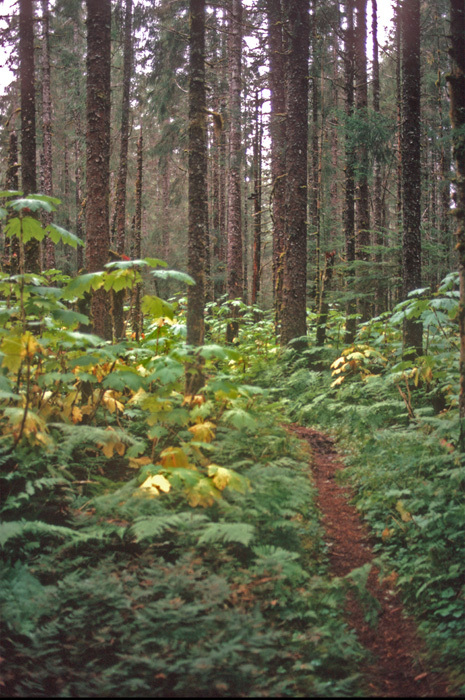 Some parts of the forest are set aside as wilderness to protect old-growth areas from logging and other development. Outside of these protected areas, people can cut and sell the trees. People who hike and fish and explore the many wonders of the forest have President Roosevelt to thank for setting aside the land more than 100 years ago. The same year he signed the order creating the Tongass National Forest, Roosevelt created the Chugach National Forest. He set aside more than 5 million acres to protect this area's fish and wildlife. The Chugach National Forest is the second biggest in the nation. It stretches across Prince William Sound from the Kenai Peninsula to the Copper River Delta. It may be big but isn't far from more than half of all Alaskans. 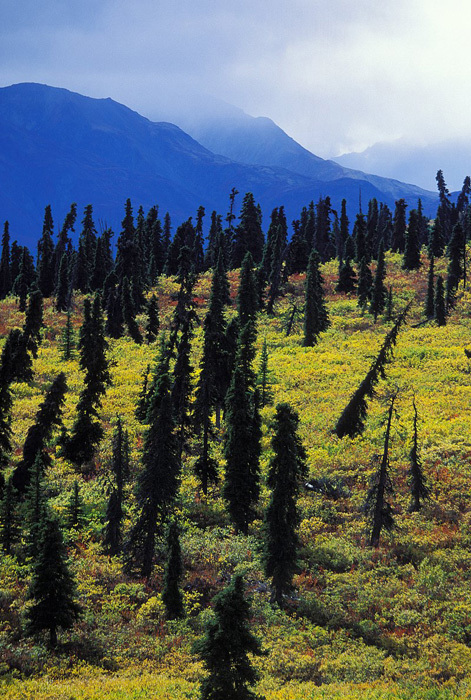 Farther north and inland are Alaska's boreal forests. 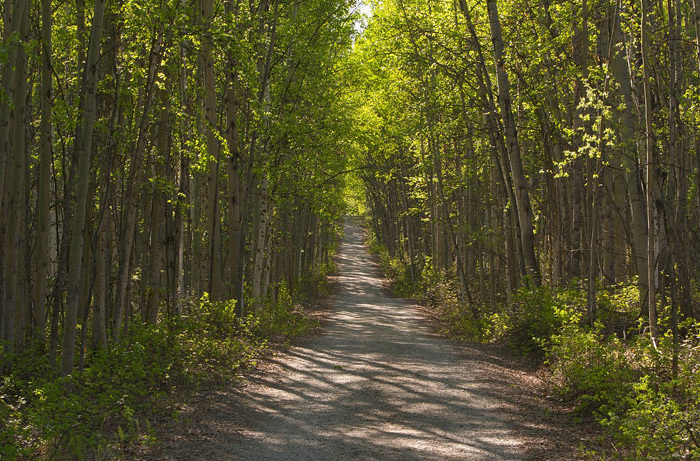 Spruce, birch, aspen, poplar trees, and smaller willows and alders grow in these forests. The deep cold temperatures of the interior winters, the dry climate, and the frozen ground all tend to stunt the growth of the trees. Most trees are short and skinny. You may have seen the patches of small black spruce that some folks have nicknamed pipe cleaners because they are small and thin. Others describe them as drunken because they don't grow straight. 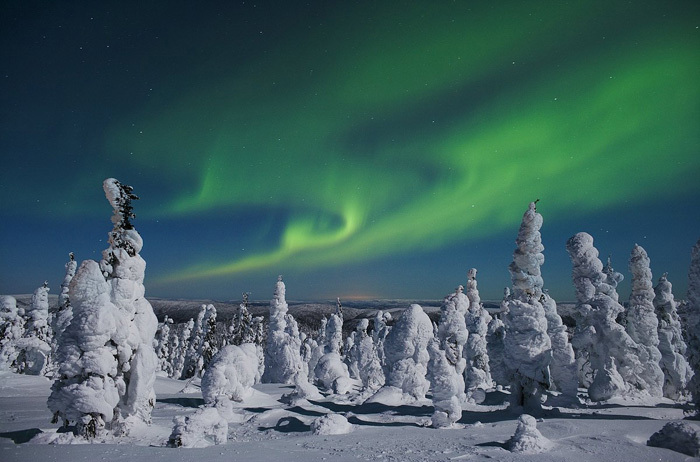 You might wonder how the trees survive the deep cold in the far north. We have learned that these trees created special empty spaces between the living cells in the trunks and branches. When the temperatures begin to drop, all of the moisture in the trees moves to these empty spaces, where it freezes without hurting the living cells. The maze of small trees and alder thickets of the boreal forest provide a perfect home for moose, squirrels, fox, lynx, hares, and Alaska's State Bird, the willow ptarmigan.